Description: A large bird with black feathers, a black featherless head, short tail, and a narrow hooked bill. They have small white patches under the wing. 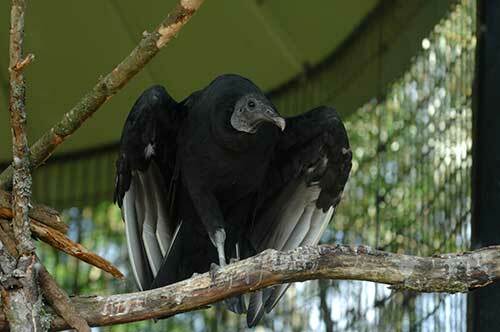 Black vultures can be 68cm (26in) in length and have a wingspan of up to 150cm (59in). 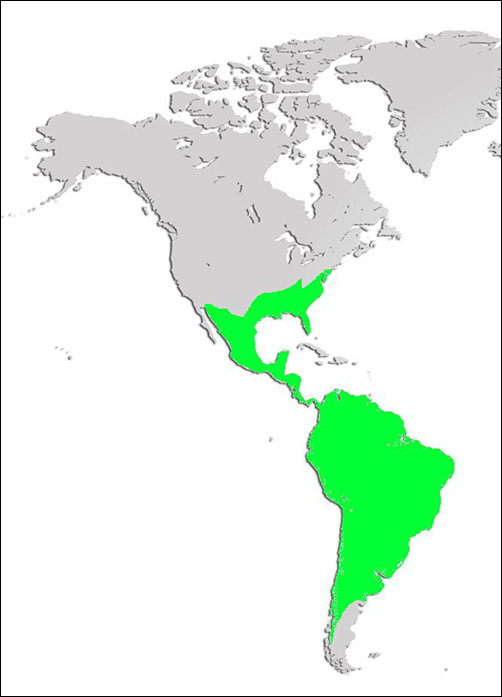 Distribution and Habitat: Found throughout South and Central America and the southeastern United States black vultures nest and roost in wooded areas and can be found in open areas near forests. Diet: Carrion eaters, black vultures use their excellent eyesight to find carcasses, or they follow turkey vultures. They can be found at dumpsters and landfills and have been known to kill prey if necessary. Life Cycle: Black vultures have strong family ties and mates stay together all year round. A clutch of 1-3 pale green eggs are laid on the ground in a dark place such as a cave or hollow trees. The eggs are incubated for 38-39 days, chicks are helpless when hatched. Parents will feed the young for up to 8 months after fledging and the family maintains a strong connection for life. Black vultures roost in large groups and discourage non family members from joining by pecking, biting, grappling, and pummeling. Did you know? Black vultures do not have a voice box! They are capable of hissing and grunting.